October 31, 2017 – Congratulations! You have a whole weekend free and nothing but the outdoors, good food and even better friends calling your name. From Friday night to Sunday morning, the world is your oyster and Northeast DC is yours for the taking. The only question is, how to spend it? Look no further, we’ll be your guide to all things #MyDCCool, and share some of our favorite neighborhood spots for 36 hours in and around Fort Totten. Let’s get started. TGIF! 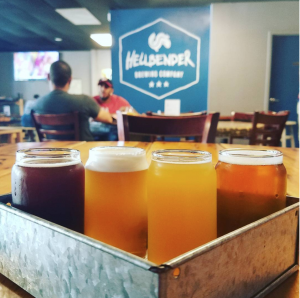 Kick off the weekend with local craft beer in the tap room at Hellbender Brewing Company. They’re open every Friday from 5pm-9pm. After your fill of brews, head to Slash Run, a quirky cool burger joint with a jukebox, musically-themed menu and over 100 kinds of whiskey. Bonus: they also host trivia on Thursdays. Once you’re full and happy (maybe with a slight buzz), finish off the night at Smith Public Trust, one of our favorite neighborhood hangouts for delicious drinks and lively conversation. Complete with a live performance stage, you never know who’s on deck to perform. Start your day with yoga or meditation in our Zen Garden. Even if you just opt to read a book, it’s the perfect way to clear your mind from the past week and to prepare for the business ahead. Next, we hope you’re hungry. The expansive brunch menu at nearby Steel Plate is not to be missed. Trust us when we say, they have something for everyone. 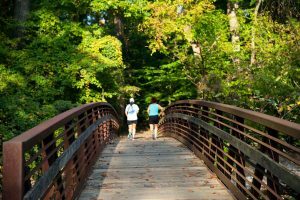 Post brunch, spend your afternoon in the great outdoors taking advantage of nearby green spaces like Fort Totten Park or the 8-mile Metropolitan Branch Trail that stretches through neighborhood, spanning from Silver Spring to Union Station. 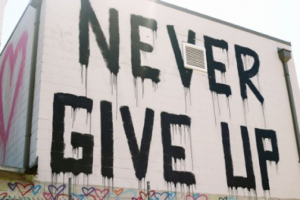 Walk, jog, run or bike along the path and take in local DC artist murals on the walls that run alongside the trail. By then you may have worked up an appetite, or at least could go for something sweet! We’re huge fans of Dolci Gelati, an all-natural Italian gelato and sorbet spot around the corner. For dinner, we’d have to recommend new addition, Library Tavern. While their menu is mostly middle eastern, they have other dishes such as burgers and wraps to appeal to a wide range of tastes. As the weekend starts to wind down, make the most of your Sunday morning. Hop on the red line and head to Union Market for coffee, brunch and tons of adorable shopping. From Bloody Marys to oysters and almost everything in between, the indoor food market plays host to a wide variety of vendors – it’s easy to spend a day trying everything in store. Reserve some time to peruse local items and do some gift shopping at Salt & Sundry and its sister, Little Leaf Shop. Thanks for spending the weekend with us! We hope you had as much fun as we did. For more recommendations, or to learn about The Modern at Art Place, do not hesitate to get in touch. We’d love to hear from you. Call us at 888-306-3899 or visit us online.